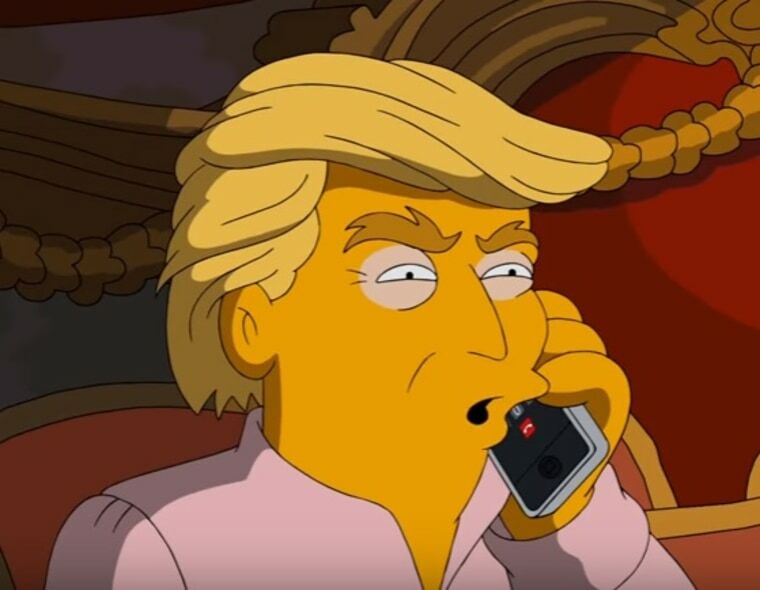 The writers behind "The Simpsons" must have one powerful crystal ball. The long-running animated sitcom predicted that The Walt Disney Company would buy 21st Century Fox — almost two decades ago. It's not the first time the Emmy-winning comedy accurately looked into the future. Here's a round-up of notable predictions from the folks in Springfield, USA. In this 1998 episode, Hollywood producers Ron Howard and Brian Grazer produce a script pitched by Homer Simpson. In one shot, a sign outside a studio lot reads: "20th Century Fox, A Division of Walt Disney Co."
In this 2000 episode, set in the future, Lisa Simpson has become president and works to get the country out of a financial hole. She inherited a budget crisis caused by her predecessor: Donald Trump. In this 2012 episode, pop star Lady Gaga visits Springfield, the generic small town where the Simpsons live. She performs for the locals, descending to the stage from a helicopter on a harness — just like she did during the Super Bowl LI halftime five years later. In this 1993 episode, Siegfried & Roy-esque casino performers make a cameo appearance — and one of them is attacked by a lion. A decade later, the real-life Roy Horn was mauled during a live performance in Las Vegas. Fortunately, he survived.